or any age or skill level. The rules are simple, and your chances of winning a hand are far better than other games like stud or draw poker. Seven total cards are played, two of which you hold in your hand, and the other five which everyone can play off of. You are trying to create the best five-card hand off of the seven available cards. This means it is possible for you to have a variety of hands, and increases the likelihood of someone else having a better hand or even the same hand. If you are a beginner and want to learn the basics of how to play, read on! Any number of players can play at any one time, but for a more manageable game there should be no more than ten players at one table. The cards are dealt to the left of the dealer, and each player receives two cards face down, with the dealer being dealt last. These two cards are known as your hole cards. A round of betting takes place followed by the dealer placing one card face down, known as a burn card, followed by three community cards played face up in the middle of the table. This is known as the flop. Another round of betting, another burn card, then one more community card face up, called the turn. A third round of betting takes place, a final burn card, and a final community card face up, the river. A final round of betting takes place after all five community cards are played, and the best hand wins. Cards are burned because the players near the dealer risk the chance of seeing the card when the hands are being dealt, giving them an advantage over the other players. played aren’t optional, they are more like antes than actual bets. These bets are placed by the two people just to the left of the dealer. The person sitting next to the dealer plays what is called the small blind, while the person to their left plays the big blind. The small blind is half of big blind and these raise in amount after a certain amount of time has elapsed. During the first round of betting, after the hole cards have been dealt the betting level has already been set with the big blind being played. Players have three options at this point; they can call the amount of the big blind, raise the amount of the big blind, or fold. Folding is when you determine your hand isn’t strong enough to play and you pass you cards face down back to the dealer. The small blind person only has to call the highest bet being played at the time. If no one has bet higher than the big blind, they only have to play the difference in the amounts. The person who is the big blind is the last person to bet this round. They can call if anyone has raised, raise the amount themselves, or check. Checking means they want to stay in the hand, but don’t want to put any more money into the pot. Remember, they have already placed their bet as the big blind. After the flop is laid down the second round of betting commences. Unlike the first round, the first person to bet this round and every round following is the person to the immediate left of the dealer, who was the small blind. The play then continues around with the dealer being the last to bet. If any of the players folded during the previous round of betting, play skips over them and continues on to the next person, always in a clockwise direction. A player may elect not to bet anything, and may check instead. This can only happen until someone places a bet, in which case that amount must be called (or raised) in order to stay in the hand. Betting continues in a similar fashion after the turn and the river are played. Once all bets have been made a winner for the hand can be determined. This is done either by the players who are still in the hand (those that have called all bets that were made) showing their hands, or everyone folds. In the first scenario, the person with the highest hand wins. 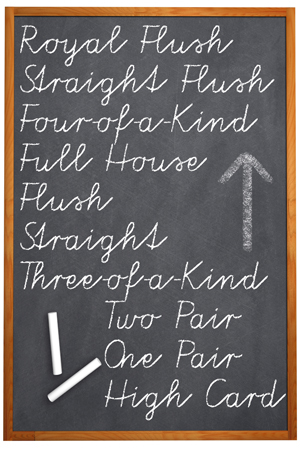 If two or more players have the same hand, then the pot is split evenly between them. This usually occurs when the board (the community cards) has the best hand, or four of the cards are being used to create your hand. In the latter option, the last person to bet would win the pot. This may either be the person who placed a bet that nobody wants to call, or the person that is last in the betting. There are few things more exciting in a game of poker than when a player announces that they are going ‘All-in’. This means that they are going to bet all of the chips that they are currently in possession of that they have the best hand. This may also occur when a player is sitting short-stacked, that is to say they have the least amount of chips in the game. It is a good way to double up your chips fast, and also a very fast and easy way to exit the game. All-in bets may be played during any betting round. When a player goes all-in, everyone else still in the hand has the chance to call. If you wish to call but don’t have enough chips to cover the amount, a side pot may be created. This would put you all-in as well. The side pot would be all of the chips that have already been bet in previous rounds, the current amount you have left, and whoever wants to call this amount. This amount would be all that you would be able to win. The person that originally went all in would subtract the amount you were able to bet and put the surplus in a separate pile. *Anyone who wants to call would have to match the original all-in amount, and would put the surplus in the separate pile. If nobody else called the original all-in amount that player would take back the difference, matching your amount only, and play would continue as normal. Players in the round that have more chips left after calling the all-in bets may continue to bet between themselves, creating yet another side pot. They may also agree to check the remaining betting rounds, eliminating the need for a side pot. Player 3 calls the all-in with a 10-high straight. $350 from Player 1, Player 3 and Player 4 go into the pot with all the previous bets as well as Player 2’s $350. This pot can be won by all players, but Player 2 cannot win more than this amount. The remaining $450 ($150 from Player 1, $150 from Player 3, and $150 from Player 4) go into a side pot. This pot can be won by Player 1, 3 or 4. Players 3 and 4 can bet between themselves into a third pot. Only Players 3 and 4 are eligible to win this amount. Looking at what hand each player has, this is how the money would end up. The main pot would be won by Player 2 with the full house. *If Player 1 and Player 2’s hands were switched, Player 1 would win the first and the second pots and Player 2 would win nothing. **If Player 3 or 4 had the best hand (say they had the full house) they would take all three pots, and the others would not win anything. If there are only two players in the all-in round, both players must show their hands while the rest of the cards are dealt. If there are players all-in, but bets are still being made into side pots, the hole cards are not to be shown until all betting has been completed and the winning hand is being sought. If you think you have the best hand, it is smart to bet big. Don’t bet too much too quickly though, or you might not get anyone to call you. The longer you play with a certain group of people, the better you will become playing against them. Watch them carefully as you play; you can learn their betting styles as well as any ‘tells’ they may have. Tells are little movements, usually unbeknownst to the player themselves, that they make when they have a really good hand or are bluffing. Don’t let them know you know what their tell is! The only way to learn how to play poker is to actually play it.